It can be quite frustrating if you are into skateboarding and you live in an area where there’s no skateboarding park of its own, nowhere to skate and practice in perfecting your skating skills. 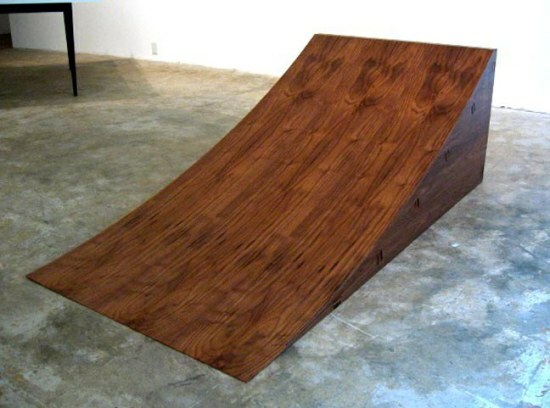 You can learn how to build your very own skating ramp with the use of wood. This could solve your dilemma of where to find a place to skate. A lot of skaters all over the are creating their skating ramp just in their very own backyards. This way, they can skate anytime they want to when the mood strikes and hone their skating skills. Taking one sheet of plywood 3/” size, lay on flat surface whether a table or a floor. Using your pencil, lightly sketch a line on the board’s right side at about 2ft up. Going out to its left then stopping at the board’s center, a second line can now be sketched. Up across the plywood sheet’s bottom, draw a 3rd line. This will then be your ramp’s bottom. By drawing a line which is curved, you can connect the bottom line to the top line. Using the saw, cut on the line’s that you have drawn before. On another ¾” sheet of plywood, the same process must be repeated. This will then serve as your ramp’s sides. Your ramp’s braces will then be right in these two pieces’ middle when you start installing them. Get your 2×4 wood pieces. They should then be secured to the side pieces starting at the bottom. To enable them to offer good ramp support, they should be evenly spaced out. Using a hammer and nails, each 2×4 wood should be nailed to the side. On the ramp’s front, proceed in nailing a 3/8” plywood piece right on top of your 2×4 supports. As you move the ramp up, the boards must be gently bent for to be able to follow the ramp’s upward curve. Using the piece of sandpaper you have, sanding of the ramp’s edges and board can now be done. Go on with your sanding until the surfaces are splinter free and smooth. Get an old rag to wipe the dust away.